Ask most non-Baptists (and even some Baptists!) what is the Baptist distinctive and they likely will say, “Baptism of adults by immersion.” Of course, there is no one Baptist distinctive. 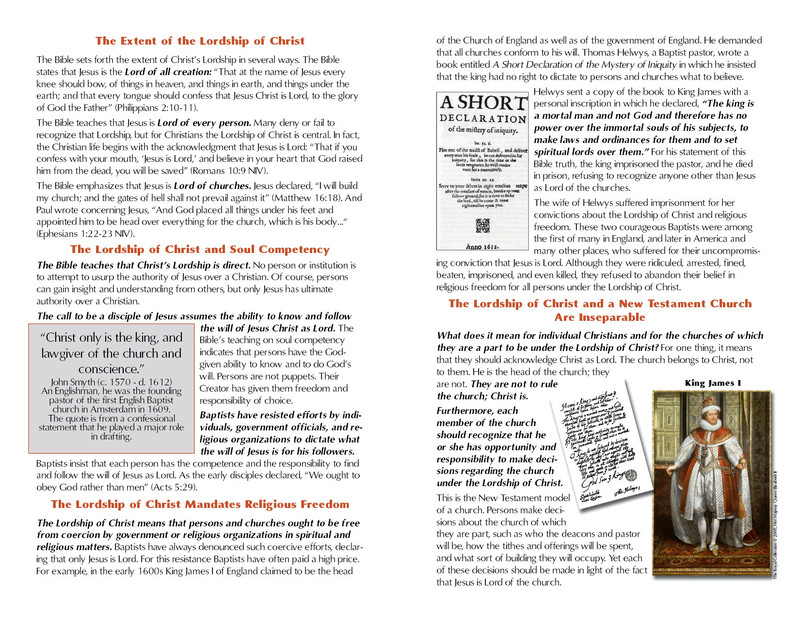 Why then do many people regard baptism as practiced by Baptists to be our distinctive? 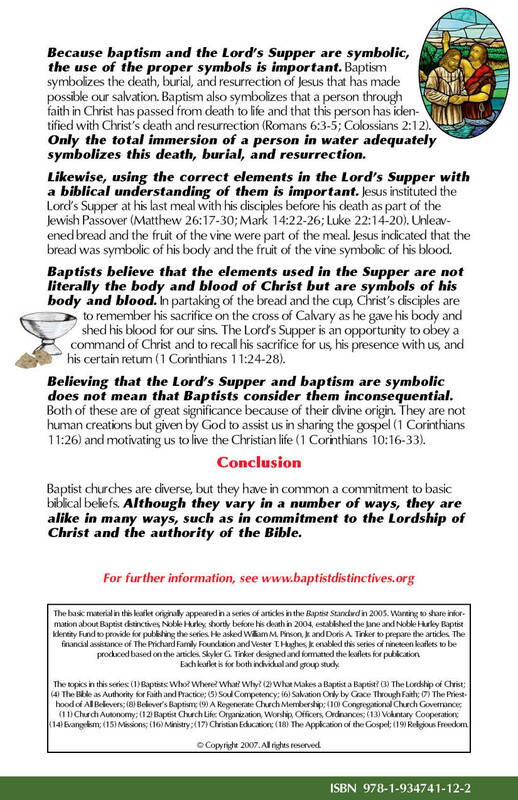 A possible reason is that Baptists are one of the very few denominations which practice believer’s baptism by immersion and do so as a symbol of having been saved, not as a requirement for salvation. In previous centuries, rulers of both state and church launched persecutions against Baptists for this practice. In the face of such harsh resistance, as well as the inconvenience of immersion, why have Baptists stubbornly held to the belief in and practice of believer’s immersion? The answer is found in basic Baptist convictions. 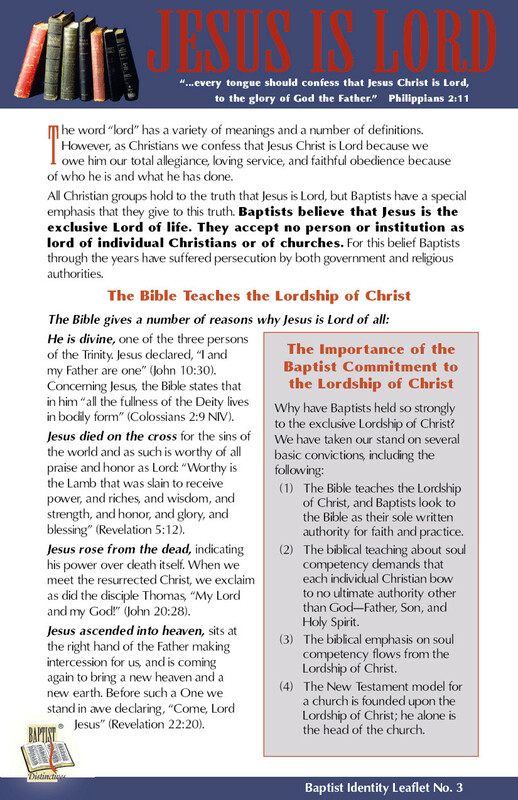 Furthermore, Baptists point out that in the New Testament a commitment to believe in and follow Jesus as Lord and Savior was always voluntary. Therefore, baptism as a sign of such commitment ought always to be voluntary. 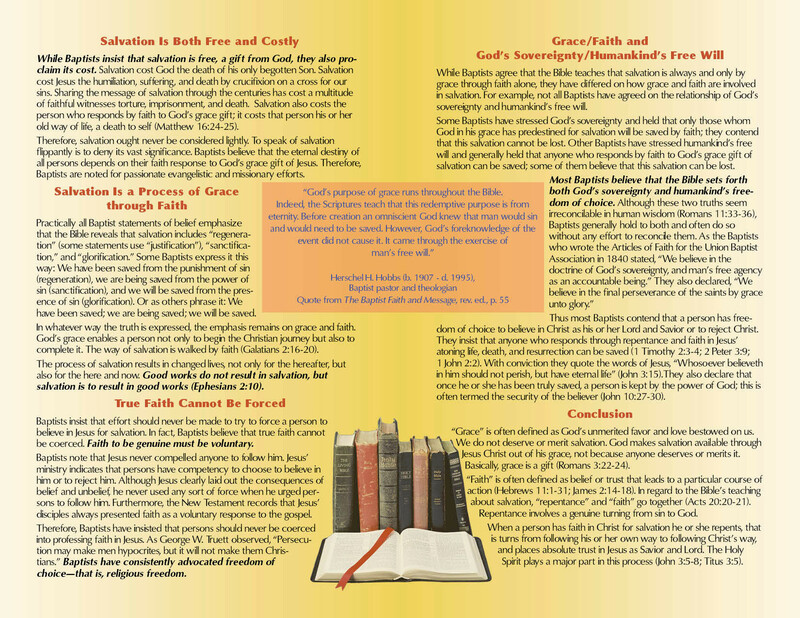 Because of these convictions based on the Bible, Baptists do not baptize infants. This refusal has resulted in persecution. For example, Henry Dunster, the first president of Harvard University, was forced not only from his office but banished from Cambridge for refusing to have his infant children baptized in the state-supported church. Although some early Baptists baptized by pouring or sprinkling water over a person, Baptists concluded that immersion of a person’s entire body in water was the only biblical way to baptize. Therefore, in spite of persecution, inconvenience and ridicule, they began to practice baptism only by immersion. Today, that is the Baptist way throughout most of the world. Christ’s disciples in New Testament times baptized by immersion (Acts 8:36-39). Immersion is a means not only of declaring that Christ died, was buried and was resurrected to provide salvation but also of testifying about our own hope of resurrection (Romans 6:5). The New Testament teaches that immersion is a way to symbolize that a believer has died to an old way and is alive to walk a new way in Christ (Romans 6:3-4; Colossians 2:11-12). 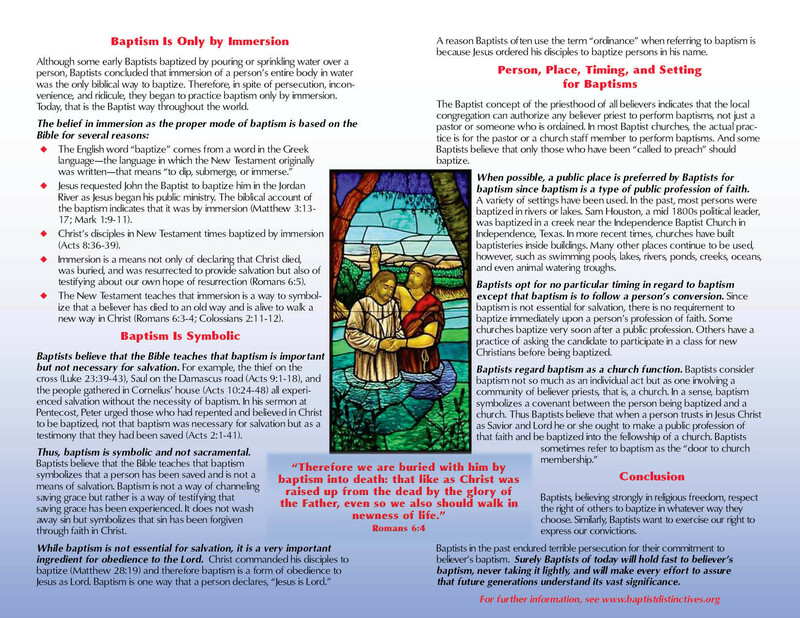 Baptists believe that the Bible teaches that baptism is important but not necessary for salvation. For example, the thief on the cross (Luke 23:39-43), Saul on the Damascus road (Acts 9:1-18) and the people gathered in Cornelius’ house (Acts 10:24-48) all experienced salvation without the necessity of baptism. In his sermon at Pentecost, Peter urged those who had repented and believed in Christ to be baptized, not that baptism was necessary for salvation but as a testimony that they had been saved (Acts 2:1-41). Thus, baptism is symbolic and not sacramental. 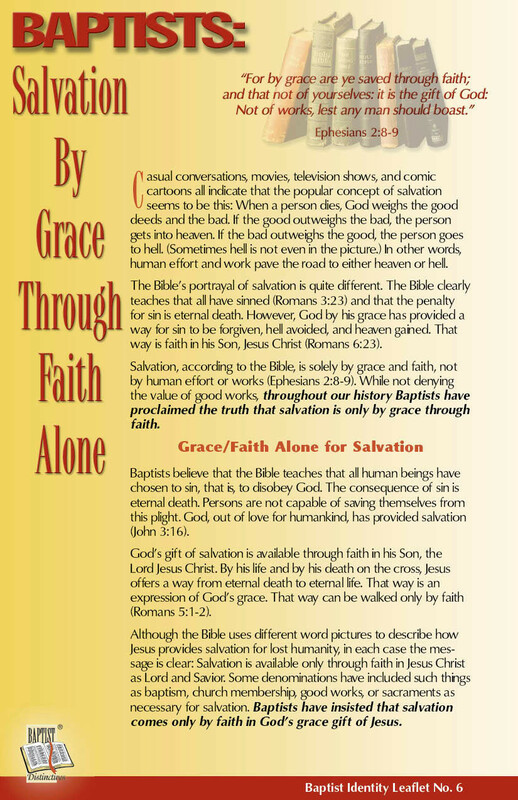 Baptists believe that the Bible teaches that baptism symbolizes that a person has been saved and is not a means of salvation. Baptism is not a means of channeling saving grace but rather is a way of testifying that saving grace has been experienced. It does not wash away sin but symbolizes the forgiveness of sin through faith in Christ. The Baptist concept of the priesthood of all believers indicates that any believer priest authorized by the local congregation can perform baptisms, not just a pastor or someone who is ordained. In most Baptist churches, the actual practice is for the pastor or a church staff member to perform baptisms. Some Baptists have insisted that only those who have been “called to preach” should baptize. When possible, a public place is preferred by Baptists for baptism since baptism is a type of public profession of faith. A variety of settings have been used. In the past, most persons were baptized in rivers or lakes. For example, Sam Houston was baptized in a creek near the Independence Baptist Church. In more recent times, churches have built baptisteries inside buildings. Many other places continue to be used, however, such as swimming pools, lakes, rivers, ponds, creeks, oceans and even animal watering troughs. 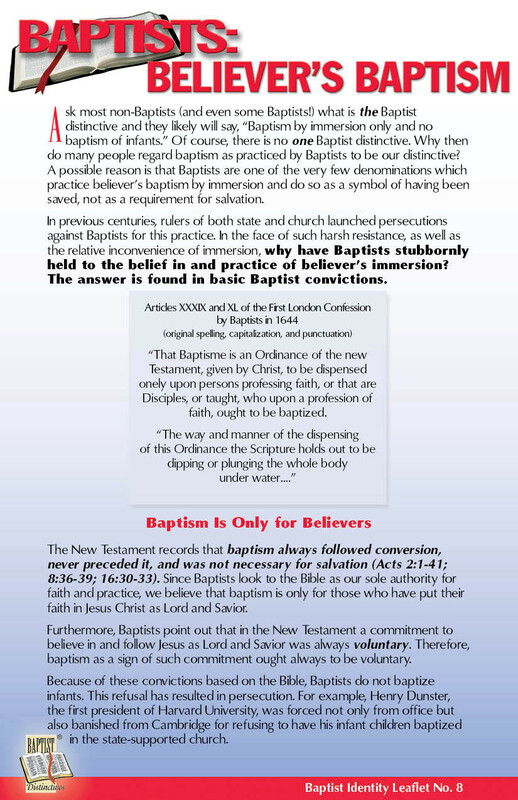 Baptists opt for no particular timing in regard to baptism except that baptism is to follow a person’s conversion. Since baptism is not essential for salvation, there is no requirement to baptize immediately upon a person’s profession of faith. 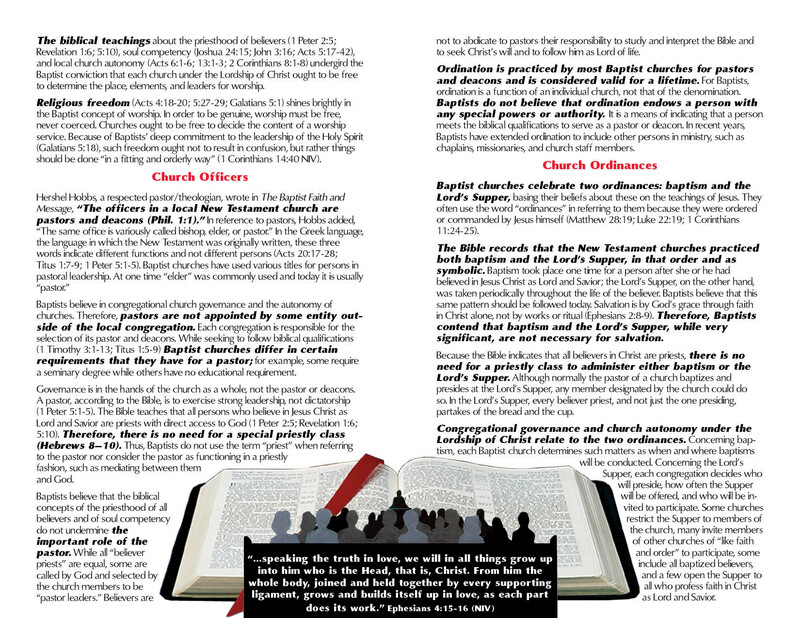 Some churches baptize very soon after a public profession. Others have a practice of asking the candidate to participate in a class for new Christians before being baptized. 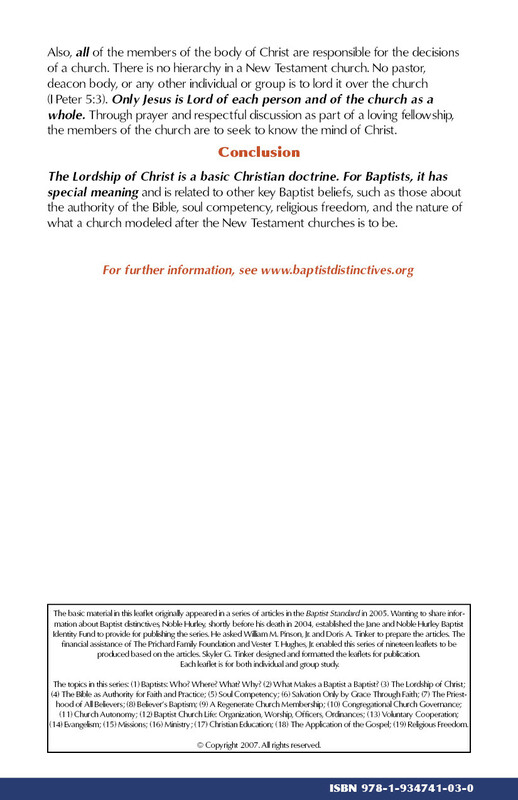 Baptists regard baptism as a church function. 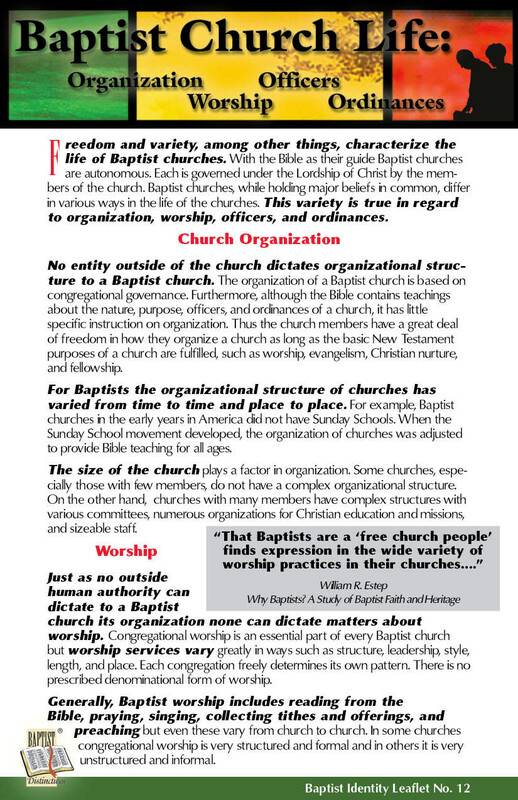 In fact, Baptists believe that every person who is baptized ought to become a member of a local congregation. Baptists consider baptism not so much as an individual act but as one involving a community of believer priests, that is, a church. In a sense, baptism symbolizes a covenant between the person being baptized and a church. Baptists, believing strongly in religious freedom, respect the right of others to baptize in whatever way they choose. Similarly, Baptists want to exercise our right to express our convictions. Baptists in the past endured terrible persecution for their commitment to believer’s baptism. Surely Baptists of today will hold fast to believer’s baptism, never taking it lightly, making every effort to assure that the generations to follow understand its vast significance. or taught, who upon a profession of faith, ought to be baptized.